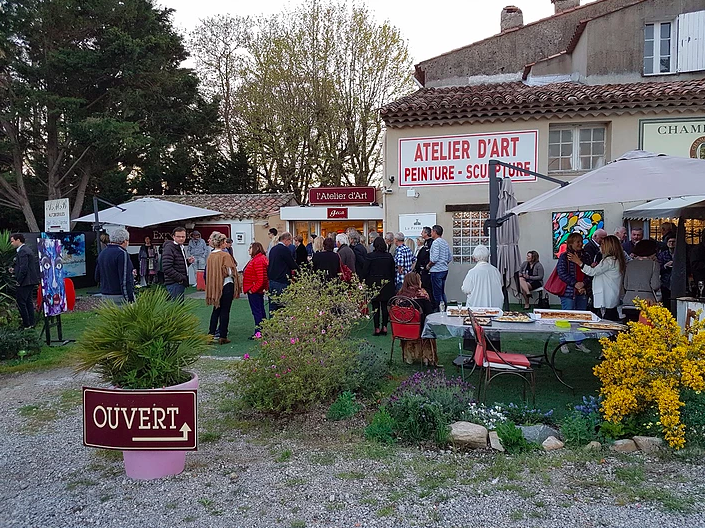 Grimaud is a land of culture and art, and it was with great pleasure that we attended last Friday the springtime exhibition of the Geca gallery, the den of the painter Georges Cabot. 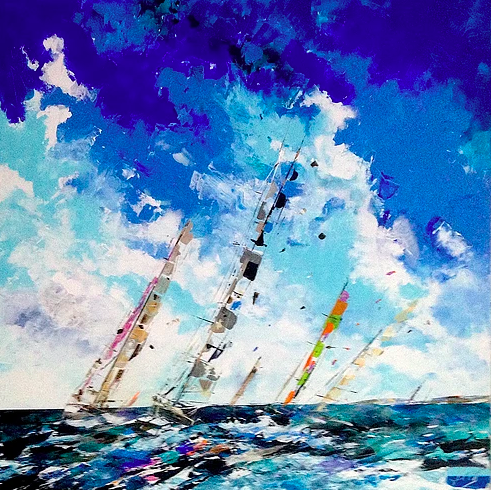 Georges Cabot, also known by his artist name, Geca, painted with knife and acrylic superb colorful canvases of which the preferred subject is nature (snow and sea landscapes). He also presented us with magnificent abstract portraits and scenes from local life (Saint-Tropez, Provencal markets, The Girl and the Cat). We discussed with him his art, his creative process, and the artists in his entourage. Georges Cabot does not only exhibit his works at the Geca gallery. 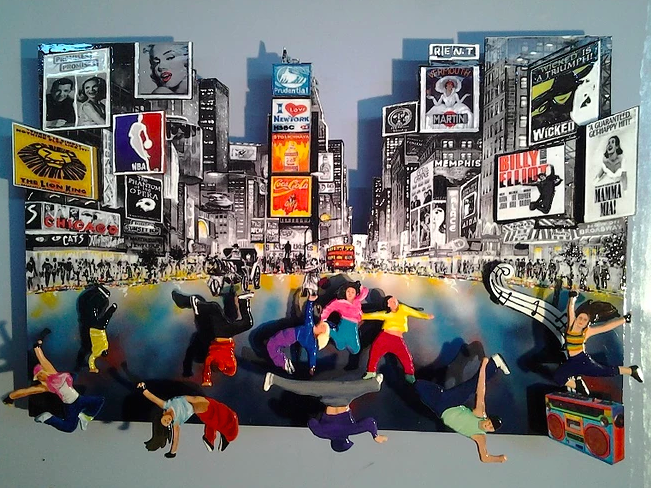 He also features talented painters, sculptors, and photographers. 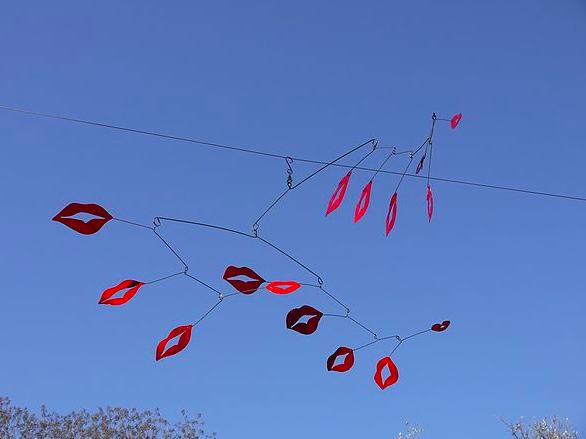 We were taken with Toffy’s mobiles, graceful sculptures that dance in the breeze and are not unlike Calder’s famous mobiles, as well as with the playful and colorful creations, and often romantic, of the painter Pierfranco Cerutti. Over a glass of rosé or a glass of champagne and a generous buffet, we were able to chat with the artists and spend time with our trader and artisan friends of Grimaud and Port Grimaud and with all the art lovers from the area, as well as those who came from far away to share this evening with us. Some of you were also there for the spring break, and it was against a backdrop of soft and enchanting music that we all had a very lovely evening at the Geca Gallery. The gallery is open all year and we strongly encourage you to stop by your stay in Grimaud. Cette entrée a été publiée dans Grimaud le 13 avril 2017 par Boutemyblog.